Are We Preparing the Next Generation for Tomorrow's Global Challenges? New Study Suggests We Have Work to Do. RESEARCH TRIANGLE PARK, N.C., March 20, 2018 /PRNewswire/ -- As the agriculture and STEM (Science, Technology, Engineering and Math) communities celebrate National Ag Day, a new study released today found that more than 80 percent of high school science teachers surveyed think agricultural science is important, but only 22 percent say it makes up at least some of their lesson plans. 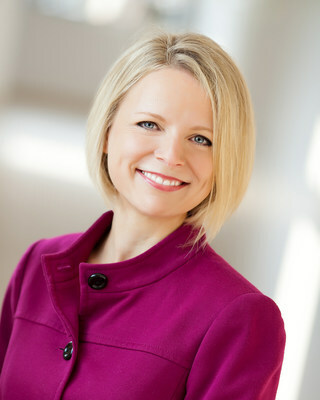 "Food security, reliable access to safe and affordable food, is one of the most significant challenges of our time with most experts predicting that by 2050, population demands from nearly 10 billion people will require a 60 percent increase in global food production," said Jennifer Sirangelo, president and CEO of National 4-H Council. "Science matters now more than ever. We need to create educational opportunities that inspire a new generation of leaders willing to tackle this challenge." Bayer and National 4-H Council also conducted a survey of more than 1,000 parents of high school students. The survey found that 86 percent of parents agree it's important for the country's future success to encourage pursuit of careers in the agricultural industries, and 68 percent said the industry provides exciting career opportunities. However, nearly 70 percent of respondents do not believe their children will pursue a career in agri-science, even though data from the United States Department of Agriculture shows tens of thousands of jobs each year in agriculture go unfilled by qualified candidates. 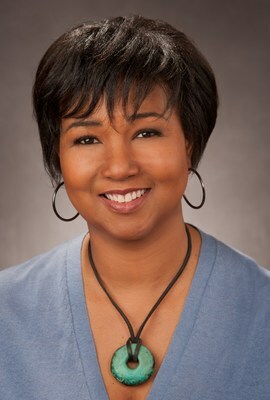 According to Dr. Mae Jemison, the first African-American woman to go to space and Chief Ambassador for Bayer's Making Science Make Sense initiative, the data for agriscience parallels an overall conundrum in science education and STEM careers. "When it comes to STEM education, studies have consistently shown our nation's youth frequently do not get the exposure to or experiences required to be successful nor are our expectations for them high enough," said Dr. Jemison. "If we are to meet the challenges facing humanity's future on this planet, such as meeting the nutrition and health needs of an ever-growing population, we need new generations of STEM-literate leaders seeking creative and innovative solutions." Engaging with 4-H clubs across the U.S. through community grants and local volunteerism to enhace the STEM education experience. For more information on Science Matters, visit 4-H.org/Bayer. 4-H, the nation's largest youth development organization, grows confident young people who are empowered for life today and prepared for career tomorrow. 4-H programs empower nearly six million young people across the U.S. through experiences that develop critical life skills. 4-H is the youth development program of our nation's Cooperative Extension System and USDA, and serves every county and parish in the U.S. through a network of 110 public universities and more than 3000 local Extension offices. Globally, 4-H collaborates with independent programs to empower one million youth in 50 countries. The research-backed 4-H experience grows young people who are four times more likely to contribute to their communities; two times more likely to make healthier choices; two times more likely to be civically active; and two times more likely to participate in STEM programs. 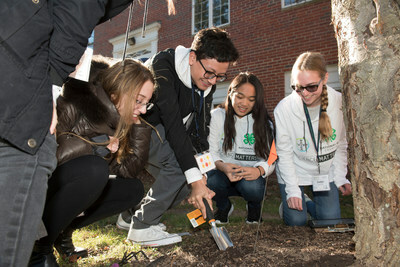 Learn more about 4-H at www.4-H.org, find us on Facebook at www.facebook.com/4-H and on Twitter at https://twitter.com/4H. The 2018 Bayer/4-H Science Matters Parent Survey, administered by ORC International, presents the findings of an online survey conducted January 9-15, 2018, among a random sample of 1,004 parents of children ages 13-17 years old. The margin of error for a sample of this size is ± 3% at a 95% confidence level. 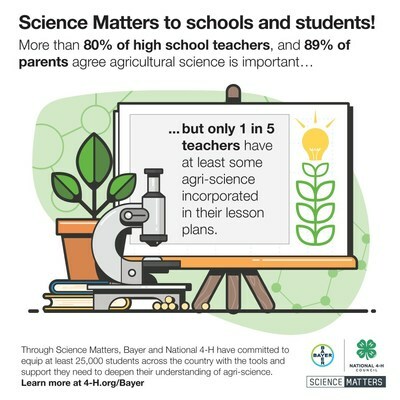 The 2018 Bayer/4-H Science Matters Teacher Survey presents the findings of an online survey conducted January 10-22, 2018, among a sample of 1,640 high school science teachers who are members of the National Science Teachers Association.